This was a definitive Nineties classic. Marvel Comics launched a new title for artist Jim Lee to actively co-plot. The result was a perfect storm of a bestseller. The great Lee art, the multiple covers, a new number one issue, and comic book speculation, these were all factors that resulted into a genuine Guinness World Record. Over seven million copies of the first issue were sold.This effectively relaunched the X-Men and defined them for a decade. This trade paperback collects the first seven issues of X-men. This was the best Lee would ever be on the X-Men, and also the last Chris Claremont arc before a lengthy sabbatical from the characters he’s most identified. Granted, the scripting was mediocre, but the art was phenomenal. Whenever I think of Jim Lee’s X-Men, these are the issues that come to mind.I definitely bought this for the art and I wasn’t disappointed. It was a visually appealing book, I could burn time away just flipping through the pages and appreciate Lee’s impressive technique. The term “superstar artist” fits him like a glove. Since the new X-Men title X-Men Forever picks up in the middle of this story, I figured I should re-read it. It's been ages since I last did and I couldn't remember what had happened.The story is a bit convoluted (but then what Claremont story isn't? ), but it was interesting and enjoyable. I really like Magneto's internal conflict about his own destiny; he's swiftly becoming a favorite character as I re-read old issues. The second half of the story, which deals with Wolverine being kidnapped by the crazy German twins and the Japanese dude with the crazy mullet, was also pretty interesting, and I like seeing the flashes of memories starting to emerge.Claremont's writing... sigh. All of the internal narration drives me batty, but at the same time, it is kind of entertaining. And I can't help but like Jim Lee's art. It's iconic at this point.If you're picking up X-Men Forever, I'd definitely recommend reading or re-reading this collection, just to brush up on Claremont's 'verse. When I picture comics, I picture 90s X-Men. 2 words: Jim "AMAZING" Lee. Great art and good storytelling yet again! This was a great new beginning for the X-men with the division of Blue and Gold teams. The glory days.. Essentially one and a half stories are collected in this volume. The first is Claremont's final 3 issues of his long, long run as writer of the X-Men. He apparently left after disputes with his editor and didn't return to Marvel for 7 years. It's an okay story. A bit wordy, as is Claremont's tendency, and involves Magneto being targeted on Asteroid M. I don't know the back story, so a bit of the narrative was lost on me. The next part involves Omega Red coming back into Wolverine's life after 30 years. Again, didn't have much backstory (don't even know if it was needed) so I may not have gotten as much out of it as I could've. Interestingly enough, the final page finishes with "The End," but it certainly didn't seem like the end. I'm not interested enough to find out what happens, though. The third star is essentially for the first three issues. The rest is a two-star book in my opinion. These early X-Men issues mark the end of Claremont's epic run with the X-Men as control of the series is turned over to Jim Lee for better or much worse. I'm glad I read this from a historical perspective but once Claremont was out so was I. Generally when most people, at least my age, think of the X-Men, this book typifies what they think of. Mostly because if they read any books it was likely this. And perhaps more importantly this is the era when the 90s cartoon was made, and they pulled the costumes and the team makeup from this rebuilding of the franchise. It also marks a pivotal point in both the rise and fall of comics in the 90s. But enough on the history...This book builds off of the original 5 X-Men coming back into the fold, as well as the rest of the scattered X-Men, minus a few, all forming back together post-X-Tinction Agenda and Muir Island Saga. The mansion gets rebuilt to give the reader familiar surroundings. And they split the now massive cast into two teams in order to print two different X-Men books, and thus make more money. This volume contains the first seven issues of the new book they created. It appears they were definitely trying to pad this book's initial success by the team makeup as they seemed to pick the fancier characters at the time. Though they still crossover other characters aplenty. This particular volume is split into the two first storylines of the book. The first three issues are meant to be the ultimate and final Magneto story. Whether it meets one of those criteria is up to the reader, but it of course didn't end up being the final Magneto storyline. More importantly however it is the final storyline which involved Chris Claremont in his 15 years on the X-Men books. Well that is until he came back many years later far worse for the wear... And then he came back again... And now he's gonna come back again and start back where this Magneto storyline left off...The second storyline introduces Omega Red and of course capitalizes on the Wolverine popularity. It is obvious throughout this title that Wolverine is the money-maker. Way too much focus on him... but not everyone would feel that way.Jim Lee is on art duty, and also story duty throughout (he co-plotted the Magneto storyline with Claremont). This is vintage Jim Lee. If you like his art you'll love this. If you grow sick of his characters always looking the same, always using the same poses, always being excessive, well that's all here too. The book is full of all out action, loads of various characters, lots of screaming faces. Its 90s comics. I would also like to note, John Byrne's scripting of dialogue for a couple issues was quite dated. He wasn't quite with the times at this point. Lobdell does a better job.Overall though this book is a good kick-back-and-enjoy book. It is the X-Men at its popularity's peak. The stories may be a bit brief, though thankfully complete. But it is fun. Jim Lee made a name for himself in the late 80's with his legendary run on Marvel's Uncanny X-Men series, so it's no surprise that when given the chance to launch a brand new X-Men series in 1991 it broke all previous sales records and was the most talked-about comics event until the "death" of Superman. The Marvel Legends: X-Men - Mutant Genesis trade paperback collects the first seven issues of that new series (Lee's entire run prior to leaving to start Image Comics).The stories collected here are pretty decent, but aren't the best from ether Claremont or Lee. Claremont's Magneto story is probably the better of the two, as it returns Magneto to villain status in a big way. Lee's story was more dynamic, and had some of the paramilitary flavor he would use as the backbone for his Wildstorm Universe.The artwork is gorgeous during the first half and a bit of a mess for the remainder of the book. I think deadline issues were to blame, as Lee has a reputation for not being able to stick with a monthly title. He had a few months to get the first few issues done, so naturally they're amazing to look at. The remaining issues are obviously the work of someone who was in a hurry.My only complaint with this volume is the binding. It seems way too flimsy and after a few readings my copy looks much worse for wear. Maybe Marvel will give this the Premiere Classic hardcover treatment some day.If you were an X-Men fan in the 1990's, you don't need me to tell you why you should have this volume in your collection. IF you came to the X-Men later, trust me when I say that what Claremont and Lee did on this title definitely influenced today's X-Men. Okay. So, after my last X-Men paperback, I decided I was going to go back to the very beginning of that universe/reboot, and read the whole thing in order. I researched online and found issue #1 of that series, and put a hold at the library for that (this) trade paperback. I was pretty happy with this plan.This plan sucked. Issue #1 it may have been, but still it was a jump-in to already existing plotlines and characters, with very little introduction to either. I did finally figure out who that lone gambler was in the New Orleans story in Fables, but I still don't know why I should care about him. Rogue was somewhere in between the wilting flower of the movies and the badass she becomes later in this series. I tried to find a character I really liked, but after several too many thong shots and seriously, I don't care if they do just have ginormous breasts, when they're fighting they would want those babies strapped down and not projecting straight out like glue-gunned on cantaloupes, I was all too happy when the story came to an end.This experiment is over for now. There are too many comics series I actually like, I can let go of the superhero comics for now. The debut of the "iconic" 90's costumes and the Blue/Gold Team split, this is a pretty good storyline to read through. The art is also amazing. Even so, it is not quite as good as the majority of the rest of Claremont's run as he wanted to take the book in other directions. I read the beginning of Claremont's run digitally on my kindle (40 Years of X-Men Collection) then this and his X-Men Forever Series. That really made for a great start to finish X-Men Epic. I have since taken a break after this, mainly because Claremont's departured did start a decline in X-Men stories, though there are high points.Give this collection a look but read Claremont's earlier work first. Everything you know about X-Men, the 90's cartoon, the movies to an extent, was all based on Claremont's work. And there is a reason for that. Claremont, thank you for your work on X-Men, I enjoyed your 75 - 91 run and X-Men Forever. So I grew up loving the X-Men and even watched the 90's cartoon religiously. This trade just didn't do it for me. I was especially surprised at how much I didn't like Jim Lee's art, as most people talk about it as if it should be hanging in a museum somewhere. I found that Lee consistently poses characters in the most awkward positions. Psylocke being the most obvious example, always flying in and attacking with her crotch. The first story arch set Magneto back from previous character development and the second involved Omega Red in a plot I barely cared for (or remembered.) Simply put, I was ready for the end long before it arrived. This is disappointing, as I have enjoyed many of the story lines in the X-Men series. I rather enjoy Jim Lee's art and I like the basic set-up for the X-Men at this time; split into two teams with some core members who stay at the mansion and assist them all. However, these are not good issues. The first three issues are the last of the Chris Claremont X-Men issues, and they are overwritten even for him.....dialogue crowds the page, covering most of the art, which is the main draw here. There's also gaps in the plot. The second story arc doesn't have as many unnecessary dialogue and captions, but its a more boring plot about such 90s characters as Omega Red, the sort of characters that help mark that decade as more flash than substance. This book of the first seven issues of the X-Men (Vol. 2) was really rewarding for me to read.As I'd said in some of the updates, I really han't read these stories for going on twenty years. The time that I read them before was the heyday of the X-Men, the heyday of my youth, and the (ending of the) heyday of Chris Claremont on X-Men. Mr. Claremont was really (though not realizing it at that point) the first writer of comics that I really got into.These stories are great. You've got a battle with Magneto, the introduction of Omega Red and some peeps into Wolverine's jaded past.This one's truly a gem whether you're a longtime fan or just getting into the X-Men. I had read these issues when they first came out (or probably from when issue #2 came out, having to pay the mark-up for #1) and remembered not being especially happy with them. The Omega Red storyline seemed to come out of nowhere and the villains were poorly handled. Both of those still seem to be the case (in my estimation), but the art bothered me more than anything else. Jim Lee has done much cleaner work, to be sure, but here he just wasn't consistent. Classic X-Men.This was another one I had first read in middle school.These were the X-Men characters that introduced me to the comics growing up.Two great stories one involving Magneto ,Astroid M, and The Acolytes and the other with Omega Red, Sabertooth, And Maverick (A often forgotten but favorite character of mine) This was a real pleasure to read again after so many years. 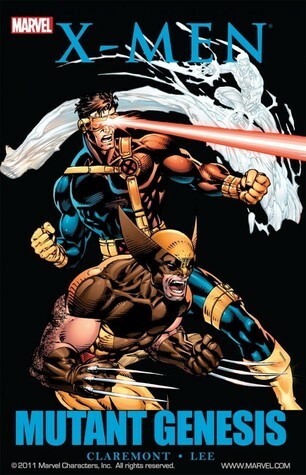 Claremont lo hizo una vez mas, pero ésta vez, acompañado del siempre perfecto lápiz de Jim Lee, quien re-definió la imagen de los X-men a como la conocemos hoy en día. Desde una confrontación épica en contra de Magneto y su grupo de acólitos, hasta la introducción de Omega Red y parte del pasado de Wolverine, este arco es sin duda uno de los mejores de los hijos del átomo. It was fun! I will teach it again. It's two separate stories bound together as one "graphic novel." I think I liked the first one better, but the second one had funny cold war era stuff. always a treat. What's there to say?It's a standard battle against Magneto and Omega Red.The story by Chris Claremont is great, as always, and the art by Jim Lee is worth framing.I could just devour the X-Men stuff from the early to mid 90s! I actually enjoyed it! the remastered version had the sense of nostalgia and Mason's new colored version matched well with Lee's artwork, but Claremeont and Lobdell in my opinion did just an okay job with the story, fun and good but not epic as well written compared to their other X-Men works! This was Claremont saying goodbye after years of writing for the X-Men. I have to say: I hated to see him leave, but I loved the way he said farewell. Probably the best X-Men story arc ever. Stuff's just as good as when I read it 10+ yars ago. Go and borrow or buy your own copy. This book comes highly recommended. Anything by Jim Lee deserves five stars in my book. I bought these comics when I was in middle school. For me, the Omega Red series was the best. Chris Claremont Jim Lee John Byrne Scott Lobdell - Chris Claremont is a writer of American comic books, best known for his 16-year (1975-1991) stint on Uncanny X-Men, during which the series became one of the comic book industry's most successful properties.Claremont has written many stories for other publishers including the Star Trek Debt of Honor graphic novel, his creator-owned Sovereign Seven for DC Comics and Aliens vs Predator for Dark Horse Comics. He also wrote a few issues of the series WildC.A.T.s (volume 1, issues #10-13) at Image Comics, which introduced his creator-owned character, Huntsman.Outside of comics, Claremont co-wrote the Chronicles of the Shadow War trilogy, Shadow Moon (1995), Shadow Dawn (1996), and Shadow Star (1999), with George Lucas. This trilogy continues the story of Elora Danan from the movie Willow. In the 1980s, he also wrote a science fiction trilogy about female starship pilot Nicole Shea, consisting of First Flight (1987), Grounded! (1991), and Sundowner (1994). Claremont was also a contributor to the Wild Cards anthology series.